Baan Puri’s impressive entrance leads past a koi pond to the spacious living and dining pavilion where guests are greeted with spectacular views down the length of the 29-metre pool and out over the ocean. To the left of the living pavilion, stretching down towards the beach, are the four ground-floor bedroom suites, each offering privacy and luxury with differing outlooks over the sea, pool and tropical gardens. The two spacious upstairs bedrooms open on to a large terrace, catching the sea breezes and maximising the view. At the far end of the pool is a comfortably furnished sunken sala and swim-up bar fronted by a wide, beachside lawn. 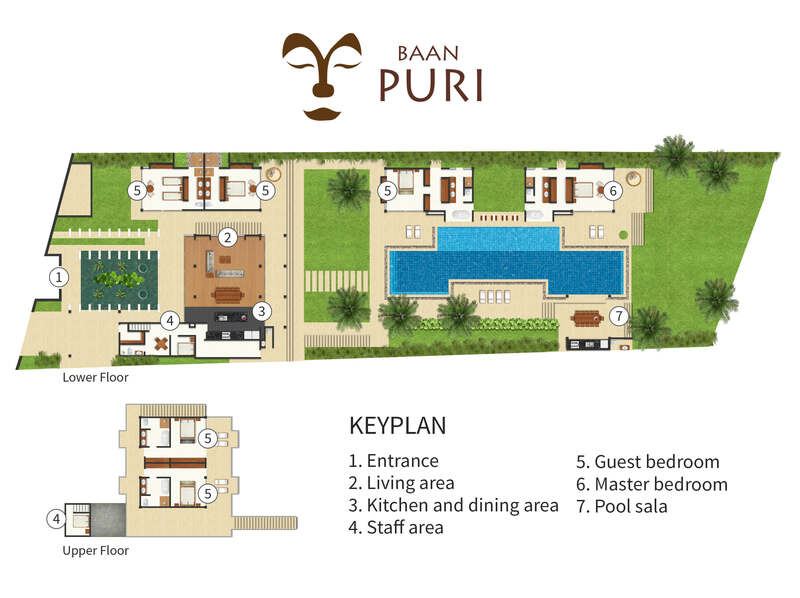 Baan Puri offers a number of inviting venues for dining, socializing or just relaxing. The main pavilion is devoted to a sleek, state-of-the art open-guest-kitchen servicing both indoor and outdoor dining areas, and a lounge with large comfortable sofas and a drop down screen which converts to a home cinema. For more formal dining, an impressive dining table can seat up to 12 people. To the front of the living pavilion is a covered, fan-cooled dining terrace, which is ideal for breakfast and casual meals overlooking the pool and view. At the beach end of the pool, a sunken sala is a shady retreat during the day and the place for early evening cocktails with a poolside bar and large cushioned wooden sofas and armchairs. On the lawn, oversized sofas and armchairs, become a magical place to watch the sunset or for a candlelight dinner under a canopy of soaring palms and a star-filled sky. Six sumptuous air-conditioned ensuite bedrooms open either onto the beach, or overlook the pool and tropical gardens. Interiors feature modern Thai-style design with large comfortable beds, armchairs and daybeds.Throughout the villa, a tasteful collection of Thai art works and sculptures provide a serene sense of place for guests of the villa. Lotus is the villa’s master bedroom, providing a luxury beachfront living experience. Opening onto its own private terrace just steps from the seashore, this beautifully appointed suite offers the most stunning views. The bedroom features a king-size four-poster bed, a trundle bed for two children, with easy chairs and indoor and outdoor daybeds. The bathroom and dressing area features a terrazzo bathtub with screen which pulls back to offer access to the swimming pool. The poolside Peony Suite enjoys a serene view of the pool and garden sala and has access to a secluded garden, shared with the Lotus master bedroom, for alfresco massages and spa treatments. This suite also features a four-poster king-size bed, a trundle for two children and a loveseat. The ensuite bathroom includes a dressing area and terrazzo bathtub with direct pool access. Privately located behind the pool area, the Orchid and Gardenia bedrooms are surrounded by the beauty of the villa’s lush gardens and tastefully arranged Thai art works. The Orchid suite features ample twin beds while the Gardenia suite has a king-size bed. Ensuite bathrooms in both bedrooms feature twin sinks and generous indoor and outdoor showers. Located on the upper level of the main pavilion, the two ocean view bedrooms open onto a wide shared terrace with wooden loungers that overlooks the pool and the beach. These two rooms feature king-size beds and ensuite bathrooms with twin sinks, bathtubs and separate showers.